Ralph Kiner, who passed away today, was a great player who played for some really bad teams. In his ten seasons, only twice was his team above .500. He never played in the postseason, and only once did he come close- when the 1955 Indians finished three games back of the Yankees in what was Kiner’s final year. He didn’t make the Hall of Fame until his final year of eligibility, and during his time with the Pirates, Branch Rickey held a grudge against him, scapegoating him for the team’s failures in an effort to make it possible to trade him for prospects*. For those reasons, perhaps it isn’t surprising that when his death was announced, his obituary in the New York Times spent just as much time on his stint as the voice of the Mets as it did on his playing days, which were, admittedly, short. And this is a shame, as in his ten seasons, nobody else hit more HRs than Kiner, and, what’s more, no World Series-era player with no postseason experience, not even Ernie Banks, had a better OPS for their career than Kiner. So as you hear people on TV, in print and online talk about his radio days, just remember that he was truly one of the great players of his time. *Interestingly, when he was finally traded, the Pirates didn’t get any good players back. Jeff Passan has an article on how the Union is worried that the contracts being offered by teams like the Cubs could be a slow march to non-guaranteed contracts on par with the NFL. You can read the article for the full details, but in essence, they are worried that the expansion of the “conversion clause” that allows a team to turn it into a non-guaranteed contract if a player does something. It’s a call-back to the eighties, when everybody was worried about all the cocaine going around, but now-a-days the MLBPA is worried about the implications that teams could not only use the clause to extend it to PEDs, but to, well, anything. That’s a big list, and the union was- if I’m reading this right- worried that such a big list and the vague writing of the contract could have allowed the Cubs to NFL-ize the contracts of anybody who, say, had a slight sprain during a pick-up basketball game or had a soccer ball hit them in the nuts. Thankfully, that vague language has been changed, so now the they probably have to actually get shot by a bow-and-arrow or falling down a cliff while mountain climbing for their deal to become non-guaranteed. Well, there goes those. Good thing the Union was able to get a change in the language of the Cubs contracts, otherwise, they could have ended up with people getting their contracts non-guaranteed after paper-cuts while playing Uno. 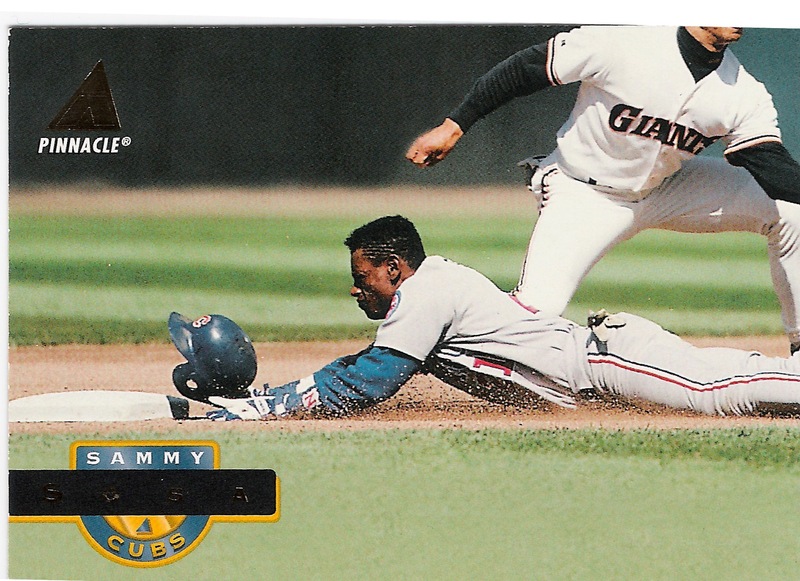 In which I write Haiku-style poetry about a potpourri of baseball cards I found in a value pack. Because, well, it’s my blog. I originally had this big plan where I would watch the now-20-year-old kid-baseball classic Rookie of the Year and figure out the statistics for it’s main character, Henry Rowengartner. But, alas, it was not to be: I inadvertently deleted it from my DVR, ruining my opportunity to bring the world such great baseball scholarship. One day, perhaps. 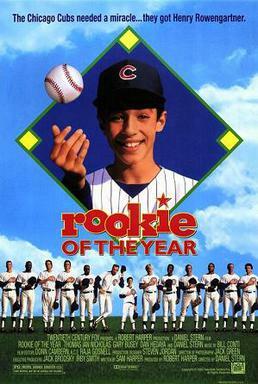 Rookie of the Year was part of an early 90s mini-fad of baseball movies sparked by the late-80s success of Kevin Costner’s films and Major League. Other baseball movies from this time period include The Sandlot, A League of Their Own and Little Big League. I saw them on VHS when I was like five or six, possibly more times than was healthy. And, although in hindsight The Sandlot and A League of Their Own* were the best of the early 90s bunch, I think I watched Rookie of the Year and Little Big League more. It makes sense, come to think of it: They were wish-fulfillment tales. Who doesn’t wish to make it to the big leagues in some way? Heck, who doesn’t wish they could be doing it when they are still kids? Anyway, for those of you who don’t know the story, Rookie of the Year is a semi-remake of an obscure movie called Roogie’s Bump. In the film, Henry Rowengartner, a baseball-loving boy in his early teens, suffers a strange injury that heals in such a way that his arm suddenly becomes able to throw MLB-level heat. The Cubs sign him, and, well, you can probably guess how the rest of the story goes. Opening Day at Wrigley, and oh what a sight! The diamond, the decorations, and the dread of yet another losing season. Really, there isn’t much more that can be said, other than that as part of the Anniversary there have been a few articles about it. For example, Yahoo!’s Mike Oz talked a bit to star Thomas Ian Nicholas (who has since gone on to star in the American Pie films) and director/supporting actor Daniel Stern about it. From it, I learned that, for example, John Candy was not originally involved with the film, but the studio liked the close-to-finished product enough that they let the producers hire John Candy to film a few scenes and voiceovers for the film. Meanwhile, as a extra to Sports Illustrated‘s “Where Are They Now” issue, screenwriter Sam Harper revealed what happened to Henry after the film. Turns out that similar injuries led to him having brief careers in football and bowling. So, if you see Rookie of the Year on cable in the coming days, feel free to think back to this post and those other articles. And also think how funky-buttloving (you’d get it if you saw the movie) awesome my look at Henry Rowengartner’s stats would have been. *True story: I almost had a cameo in A League of Their Own as a redheaded toddler grandchild in the Cooperstown scenes at the end. But according to family legend, my parents didn’t want to drive all the way to Cooperstown for the shoot, especially since if I cried they’d probably just have some other 1-year-old do it and they’d have driven all the way to Cooperstown for nothing. And that, friends, is why Daniel J. Glickman doesn’t have an IMDB page noting his uncredited cameo in A League of Their Own. Is Rock Shoulders a great name, or the greatest name? We may never know.